Losing signal and getting a slow data connection can make trying to use your mobile phone frustrating. Then there is the risk of roaming on to another network and coming home to the shock of a large bill. Satellite communications is now an affordable option for checking in with the office or letting the kids update social media and talk to their friends while on board. With the Fleet One coastal and global service, you need never be without connectivity again. 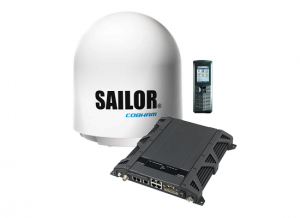 The SAILOR Fleet One, by Cobham, is the low-cost entry point to the world of maritime satellite communications. It is small, lightweight, and it is easy to install and it delivers satellite voice services and web connectivity making it ideal for use on smaller boats. With data speeds up to 100 kbps and a single voice line, the SAILOR Fleet One gives you the capability to access phone service and the internet while on board in areas where cellular coverage is not an option. Want to try it before you buy it? 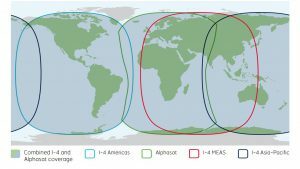 Rent the Inmarsat Fleet One Now! compact antenna, with specialized pricing plans and seasonal flexibility. finding, catch reporting and fisheries e-reporting. boosts morale. They can check the news and sports reports – all while keeping a tight control on costs. 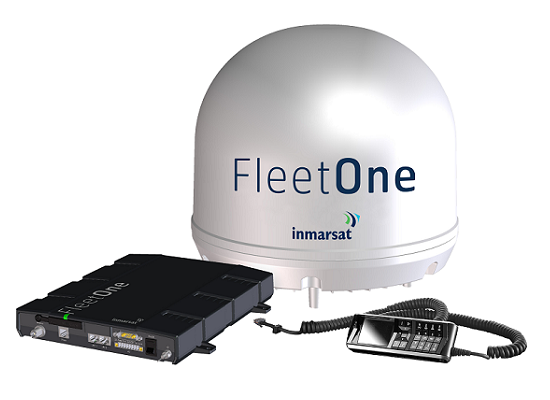 Fleet One operates on Inmarsat’s I-4 satellites, which are rigorously tested and proven as the go-to choice for commercial mariners around the world. Fleet One Coastal supports Inmarsat’s free ‘505’ safety service, which in an emergency directs a call straight through to a Maritime Rescue Co-ordination Centre (MRCC) – no matter how bad the weather conditions. So you can set sail knowing that your life is in safe hands. The Fleet One terminal has a standard “plug and play” Ethernet connection to a computer, and with an optional wireless router can support smartphones, tablets, and additional laptops – allowing multiple users to access the internet at the same time. You can depend on Inmarsat, whatever the weather conditions. We provide the most robust communications links, with average network availability greater than any mobile phone provider and exceeding 99.9%. The Fleet One terminal is specifically designed for use within the maritime environment. The terminal is quick and easy to install, with additional Wi-Fi capability to allow access to smartphones/tablets at home. The terminal has been tested and approved to Inmarsat’s exacting standards. With Fleet One, you can have the performance with flexibility at an affordable price with a choice of airtime pricing to suit your needs. You don’t have to commit to a lengthy contract and you can suspend use when the boat is winterized. Alternatively, competitive rates are available on a prepaid voucher with no commitment required. motorboats and sailing yachts in mind and is quick and easy to install. Satellite connectivity is now accessible and affordable for all vessels – available wherever and whenever you need it. 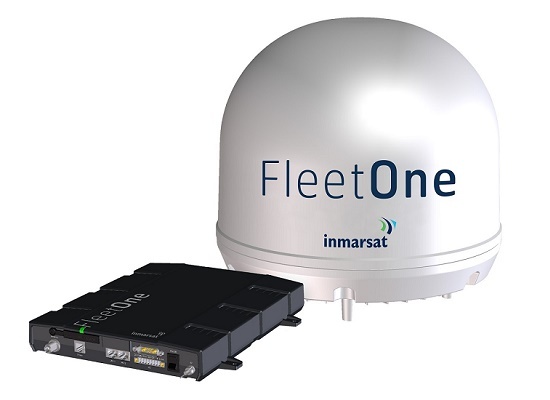 Inmarsat has introduced Fleet One Global to bring satellite connectivity within the reach of any vessel. Traditionally, satellite communications have not been considered a cost-effective option for commercial vessels with low data usage requirements. Owners have not wanted to be tied into subscription costs for a service they might only need seasonally or for occasional voyages, and only when they sail out of VHF or GSM coverage. Fleet One Global changes all that. It is simple and cost-effective, giving you100kbps connectivity at one global rate, either prepaid or postpaid. It’s flexible, allowing you to de-activate and re-activate the service at any time, so you only pay for it when you need it. Hardware costs have also been kept low to help you manage a budget, and the equipment is easy to install, needing no expert know-how. 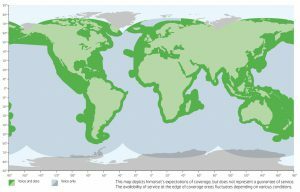 on the world’s oceans. In an emergency, Fleet One supports Inmarsat’s free ‘505’ safety service, which directs a call straight through to a Maritime Rescue Co-ordination Centre (MRCC). So you can set sail knowing you are in safe hands. With Inmarsat, you can rely on crystal clear calls, SMS texts and important emails always getting through, and being able to get the information you need from the internet at any time – no matter how bad the weather conditions are. You can depend on Inmarsat to provide the most robust global communications links of any satellite operator, with network availability exceeding 99.9%. Robust terminal Specially designed for the rough maritime environment, the Fleet One terminal is compact, robust, and easy to install. You can use the standard “plug and play” Ethernet connection for your laptop, or have the optional Wi-Fi router for multiple users. * One time $50 activation fee and 12 month contract will be applied to all plans.